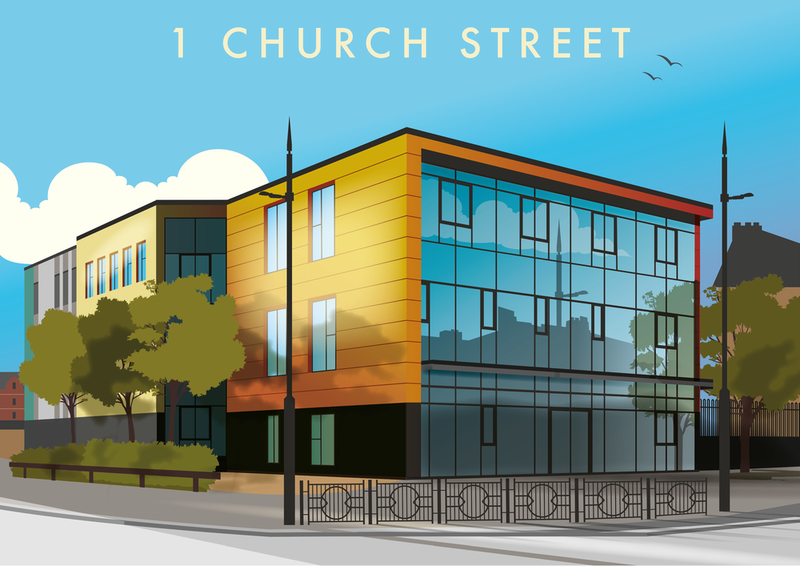 The Northern School of Art (formerly Cleveland College of Art & Design) required some illustrations of some of their buildings, most importantly their new multi-million teaching facility, 1 Church Street. The other illustrations were for one of their existing teaching facilities in Church Square, and the former Post Office building in Whitby Street which is going to be transformed into a studio and business centre for people working in the creative sector. I graduated from, then, Cleveland College of Art & Design, in June 2015 and was one of the artists of the recent artwork at Hartlepool Train Station, so it was fitting to create these illustrations in a similar style to show homage to that and continue to capture Hartlepool in this lovely vibrant style, as they were also involved in the train station project and want to celebrate their alumni's successes. The Northern School of Art was recently awarded Gold in the Teaching Excellence Framework in recognition of its outstanding quality of teaching at its university-level campus in Hartlepool, making it the top art school in the UK. My experience at the university was fantastic, the facilities (such as computer suites and the print room) are easily available to everyone who studies there and the tutors I had were kind, knowledgeable and helpful throughout my studies. It was a delight to work on a project for an establishment that did so much for me when I was a student getting my First Class Honours degree in Graphic Design. I also like to support them by regularly giving talks to current students at college and university level, to give insights into my experience of the university, working as an in-house graphic designer and working for myself. The 1 Church Street illustration was presented to Professor Madeleine Atkins CBE, Chief Executive of the Higher Education Funding Council for England (HEFCE) who officially opened the facility on the 8th November 2017, and copies were given out as invites as shown above. The three pieces have been framed and mounted and used as part of a display, but can be used for promotional purposes so may pop up on other materials in the future. The new building was funded by the Tees Valley Combined Authority, the campus facilities include flexible studio space, two seven-metre double-height studios for photography and TV or film work, a refectory area and galley, ensuring students can access the highest level of creative industry education in the north east and across the UK for many years to come. Church Square is an existing facility that I frequented during my time there, it is right near the Hartlepool Church Gallery and is such a unique building with lots of detail. Whitby Street Studios is the first part of an ambitious multi-million pound project part-funded by the Tees Valley Combined Authority to regenerate a key area of Hartlepool is now underway, which will transform the area into a hub for creative industries. Called The BIS, the centre will encourage business start-ups in the creative industries sector and provide specialist support for them.